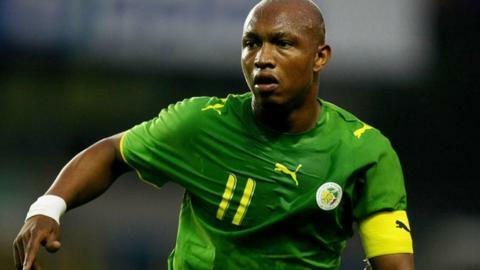 El Hadji Diouf claims he has been left out of the Senegal squad for the crucial Africa Cup of Nations qualifier against Ivory Coast because the country's football federation is "scared" of him. The former African Footballer of the Year was expected to be recalled for the match after a five year ban from all football-related activities in Senegal was overturned last month. He believes the decision to leave him out was taken by the federation and not the coach. "They're scared of me," Diouf told the BBC World Service. El Hadji Diouf claims federation is scared of him. "They do so many bad things inside, they don't like someone with a big character inside to say what they want to do. It's not like in Europe. In Europe everything is perfect. And here it's not. That's why we don't get results when we play big competitions." Diouf was banned by the the Senegalese Football Federation (FSF) in July 2011 after remarks he made in the media about corruption in African football but the sanction was lifted in September 2012. He said: "I'm not disappointed. I've played so many good games in my life. I don't want to be involved because I can't work with the federation. "After this game they're (FSF) going to go. They have to go and if they don't go I don't want to play for the national team." Diouf believes the FSF is failing to get the best out of what he thinks is a talented group of players. "(In 2012) it was the first time the Senegalese national team went to the Cup of Nations and got zero points," he added. "And now we're not sure if we're going to be at the next Africa Cup of Nations. Today the population don't want them (the FSF) but they're still here." 1965: Finish fourth at first Africa Cup of Nations. 1990: Finish fourth at the Nations Cup. 1992: Senegal host Nations Cup but exit in quarter-finals. 2002: The Teranga Lions lose the Nations Cup final on penalties before becoming the first African team since Cameroon to reach the World Cup quarter-finals. 2006: Senegal reach the Nations Cup semi-finals, but lose that match, plus the third-place play-off. 2008: After a first group stage Nations Cup exit since 1986, Senegalese fans finish the year by rioting in Dakar after the team is eliminated from both the 2010 Nations Cup and World Cup. 2012: Senegal arrive at the Nations Cup as a favourite but lose every match, including defeats to little-fancied Equatorial Guinea and Libya. The 31 year-old also insists he will not retire from interntional football and is confident he is still good enough to make a comeback. "I play good with my team. I'm involved and I score goals," he said. "Everyone knows what I'm doing with Leeds United. We're having a good season so far." Senegal are trailing Ivory Coast 4-2 going into the second leg of the final qualifier in Dakar on Saturday and Diouf admits his former teammates are facing a massive challenge. He said: "It's going to be hard. It's going to be very, very hard but not impossible. We're playing an experienced team, big players. "We have to wait and maybe win the game in the second half or maybe extra time. The young generation don't have much experience." Diouf will be watching the game from the stands and says that despite his issues with the FSF, he will be cheering the team on. "I did a lot for this national team and still I'm involved," he said. "I've got a lot of friends playing for national team and still I want them to be there at the next Africa Cup of Nations."